When most of us think of the 1950s, we think of rock n roll, greasers, hot rods, Elvis, Annette, Fabian, D.A. haircuts and teenage rebellion. But there was a flip side to this erathe side of harmony, innocence and the sincerity of dreams. It is the side thats been lost in the shuffle of progress. It was a time when most parents and kids listened and danced to the same music; when families partook of the ritual of gathering in front of the TV to watch their favorite variety shows, like the Ed Sullivan Show or the Perry Como Show. It was a time when every family worked to fulfill the American Dream. It was a period when four-part guy groups harmonized their way across the airwaves, jukeboxes and hi-fis of the country. 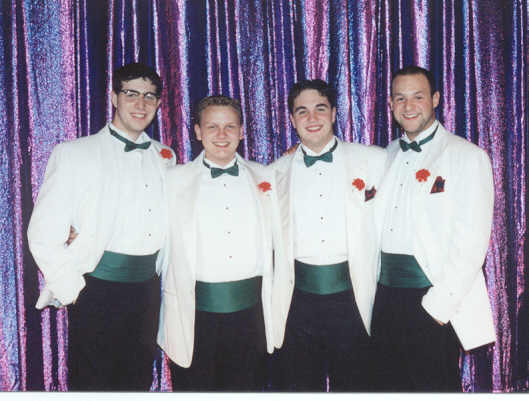 Throughout the land they would stand at a quartet of microphones, crooning a multitude of chaperoned prom-goers into dreamy romance. They wore dinner jackets and bow ties (or perhaps cardigans and white bucks). Each move was drilled to precision. Each vocal arrangement soared to stratospheric heights of harmony. This sound crested right before rock n roll stole the heartbeat of music across the globe. From left to right are: Phil Haltman as "Smudge," Nathan Morgan as "Frankie," Jeffrey Woerner as "Jinx" and Keith Presty as "Sparky." During this time, guys across the country banded together to sing in the basement for fun. If things worked out they might be hired to sing at weddings, conventions, proms and country club socials. Inspired by the success of the recording stars, they made plans to zoom into careers of fame and fortune. Produced by special arrangement with Music Theatre International, Inc.
ROSETTA SENKUS BACON (Musical Director/Pianist) A native of West Virginia, Ms. Bacon graduated from West Virginia University and received a Masters Degree from Manhattan School of Music. Her concert tours have included recitals at the Kennedy Center in Washington, DC, Taipei County Cultural Center in Taiwan, St. Moritz Cultural Center in Switzerland and Kaunus Philharmonic Hall in Lithuania. This season, she is touring the U.S. and Canada with the trio Band du Soleil, who released their first CD, Old World to New Age in September. Ms. Bacon has worked as musical director/pianist in regional and off-Broadway theaters, including Charles Playhouse Boston, Falmouth Playhouse, Theatre by the Sea, Candlewood Area Theater, MacHayden Theatre, Amos Repertory Theater and Equity Library Theater, to name a few. She was one of the duo-pianists in Side By Side By Sondheim starring Arlene Francis and Hermione Gingold. Rosetta is currently on the Music Faculty at William Paterson University. KEISTEN KUPIEC (Choreographer) A native of Dunellen, Keirsten returned to the area last year after a two-year stint at Walt Disney World, where she was featured in the Diamond Horseshoe Revue and MGMs Doug Live. She has also toured nationally with Anything Goes and Can Can. Locally, she has been seen in over 20 different productions, including Hello, Dolly!, Charleys Aunt and Nuptials at the Hunterdon Hills Playhouse. This past spring, Keirsten made her Broadway debut as part of the original cast of 42nd Street, where she continues to perform. With 42nd Street, she has been featured on the cast album, The Rosie ODonnell Show and the 2001 Tony Awards on CBS. NATHAN MORGAN (Francis) Nathan originally hails from Columbus, OH, where he attended the Fort Hayes School of the Performing Arts. He is currently a senior at Manhattan School of Music and studies voice with Maitland Peters. He will be receiving his Bachelors of Music this spring, in classical voice performance. He is performing with the American Musical Theater Ensemble for the third straight year. Most recently, he was seen in The Magic of Music at Hunterdon Hills Playhouse. Favorite credits include: Charlie Brown in Snoopy, Georg Nowak in She Loves Me, and the Witch in Into The Woods. Nathan thanks his friends and family for all of their love and support throughout the years. KEITH PRESTY (Sparky) Keith is a senior at William Paterson University and is seeking a degree in music education. He is currently the principal horn player for William Patersons wind ensemble. Mr. Prestys major is in classical French horn, but he is also pursuing a minor in classical voice, studying under the tutelage of Ms. Anastasia Cochran. Mr. Prestys favorite role to date is Jose Vegas from Fame: the Broadway Musical. He also enjoys musical directing and, most recently, served in that capacity for Children of Eden. Keith is excited to be a part of the first show at the new Dunellen Theater. He would like to thank everyone involved for this wonderful opportunity. PHIL HALTMAN (Smudge) Phil is currently a senior at William Paterson University, majoring in classical voice. He would like to thank his family and friends for their support. (Benjamin), Annie (Bert Healy), Bye, Bye Birdie (Conrad) and The Pajama Game (Sid Sorkin) at Dunellen High School. He was nominated for the Paper Mill Playhouse Rising Star Award for his performance in Annie. Jeffrey would like to thank everyone who made this production possible and everyone who always supports all that he doesespecially his mother and father.